Hooray! First day of the Southport Dress Sewalong. So excited to get started. Before getting going, make sure that your fabric has been washed and dried according to the care instructions for your particular fabric. You do not want to go through the whole process of sewing up the dress and then having it shrink the first time you wash it – believe me I have been there :(. I also think it’s a good idea to iron your fabric before cutting it out. 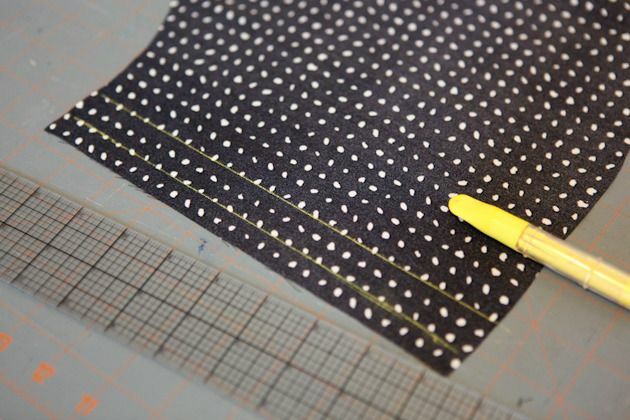 It makes it so much easier to cut and line up, especially if you are pattern matching. It also helps you get the most width and length out of your fabric. 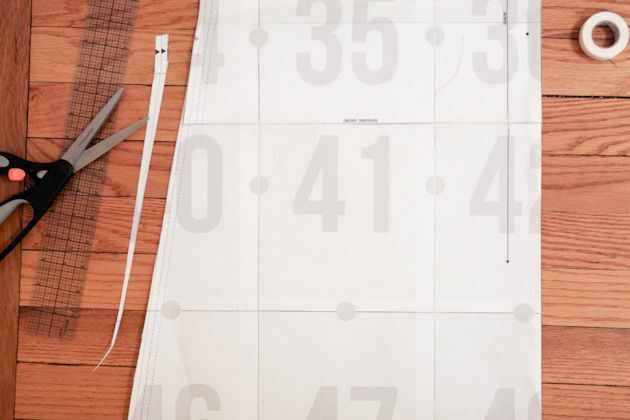 I am not going to go through all of the details here of printing your pattern, assembling your pattern, and cutting out your fabric. I’ve done it before with other sewalongs and so I think it’s repetetive for most. But you will find some links below for more help if you want it. 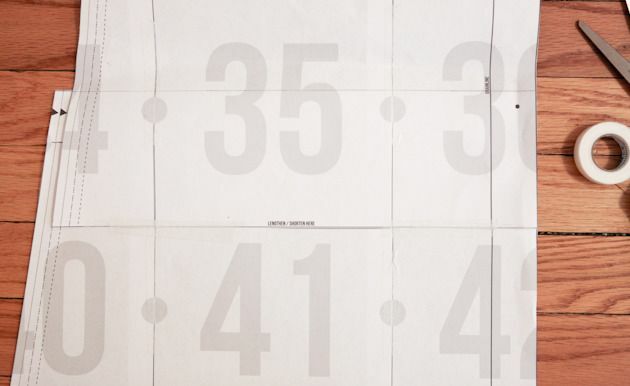 As always though, make sure that your printer is set up to print at 100% and check the 2×2 inch square on page one of your pattern to make sure that it is printing to the correct scale. You do not have to print the entire pattern if you are only assembling View A or View B. If you are making View A only print pages 1-24 and 30 and if you are making View B only print pages 1-12, 18, and 22-51. 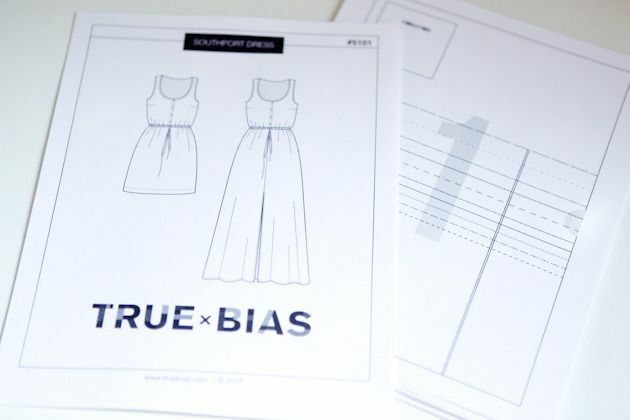 The Southport Dress is drafted for a model who is 5’5″ and the maxi length (View B) is long enough to wear with moderate heels. It measures 42″ from the waist. View A is 20″ from the waist and is drafted to hit a couple of inches above the knee. The bodice should hit right at the smallest part of your waist. To lengthen or shorten your skirt or bodice cut it along the lengthen/shorten line and overlap or separate by the desired amount. Tape in place (adding paper underneath if you are adding length). If the sides of your pattern are now a weird shape, reconnect the lines of the pattern edge so that it is a continuous straight line again. Because I am 5’3″ I have to shorten the maxi length when I am making it. If wearing flats with the dress I find that I need to shorten the skirt by 4″. I do recommend shortening the pattern on the lengthen/shorten line instead of just taking the length from bottom of the skirt pattern piece as might seem easier. The reason is that if you just take the length from the bottom then you will be losing some of the skirt width which is part of the drama of the maxi dress. Although it’s a pain (and I admit that I don’t always do it myself) it’s never a bad idea to sew up a muslin before cutting into your nice fabric. You could probably get away with just sewing up a muslin of the bodice for this dress because the skirt portion is gathered. This will give you a good idea of the fit of the bust, neckline and armholes, and if you need to lengthen or shorten the bodice before going forward. The dress is drafted for a C cup, with most of the dart being rotated to the waist for gathering. Most of my testers found the bodice to be pretty forgiving no matter their cup size, but like I said, it’s never a bad idea to test it first. Make sure that you have gathered your notions before starting. You will just need a few items. – 3 yds of single fold (1/2″) bias tape – This could be premade like the package above or homemade if you choose. 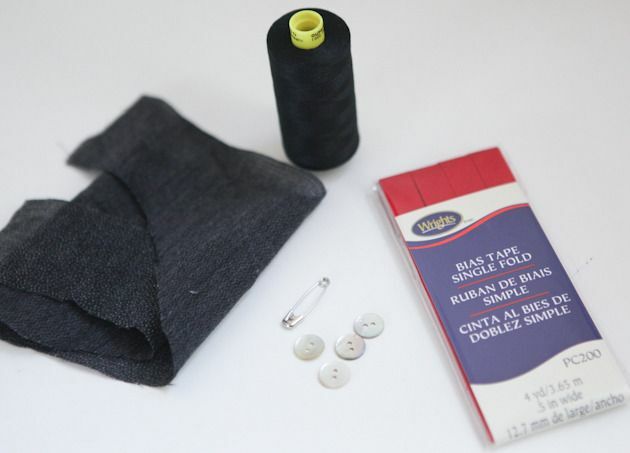 Another optional notion is to buy some drawstring or twill tape to use to gather the waist. The pattern has you sew up a drawstring, but you could certainly use store bought if you prefer. Clip all notches with your scissors. Just make sure that you only clip about 1/4″ so that it doesn’t extend past your seam allowance. 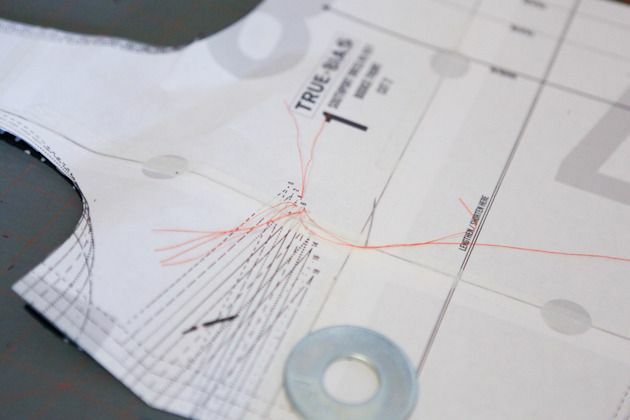 Use Tailors Tacks for the bust dart points and the circles on your skirt pattern pieces (at the pocket and on the center front slit for View B). Use chalk to mark any other important lines such as the bust dart stitch lines, and fold lines. Now that everything is marked lets start with the actual step of the instructions. All of the steps below refer back to the steps in the instructions, but have a little more specifics. Step 1 – Staystitch the front and back necklines and armholes at a scant (just less than) 1/4” in the directions shown in the instructions which is always from the shoulder and downwards. Staystitching is a row of stitching along a bias or curved seam to prevent the fabric of the garment from stretching during construction. This will really help you construct a well fitting neckline and armholes that are not flipping outwards so I do suggest not skipping over it even though it is tempting. 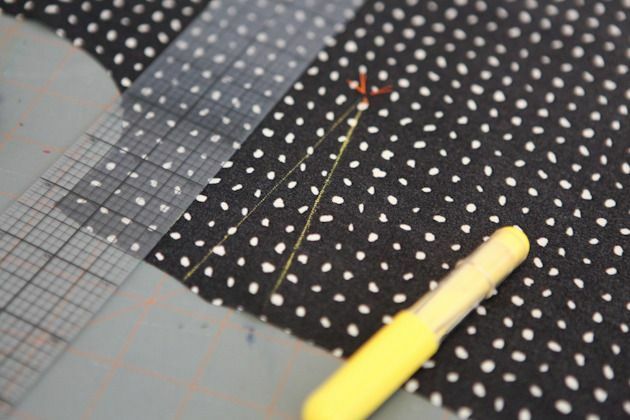 Step 2 – Fuse each of the interfacing pieces to the bodice fronts on the wrong side of the fabric, between the two fold lines and 1/4” from the top. It will also be 1/2″ from the bottom. 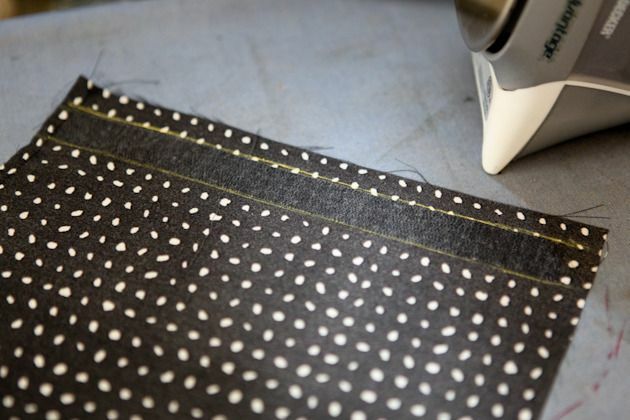 This keeps the interfacing out of the seam allowances to reduce bulk. This little area will eventually turn into your button band and the interfacing really helps reinforce those areas that will need it. Now that we are getting ready to actually sew pattern pieces together, we need to talk about seam finishes. 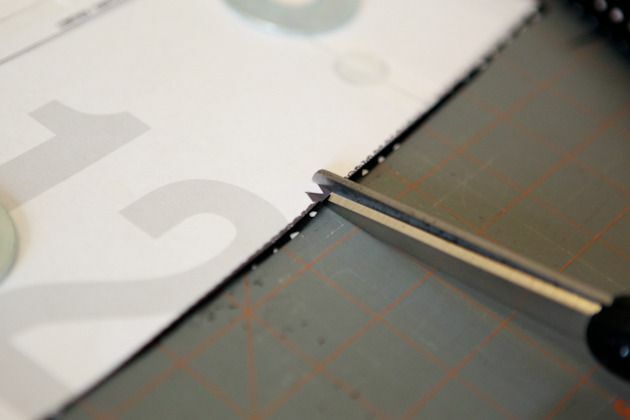 All seam allowances (unless otherwise stated in the instructions) are 1/2″. You will want to finish your seam allowances when guided to in the instructions to prevent future unraveling. You can do this in various ways such as overlocking, using pinking shears, or zigzag stitching. Below you will see examples of all three. 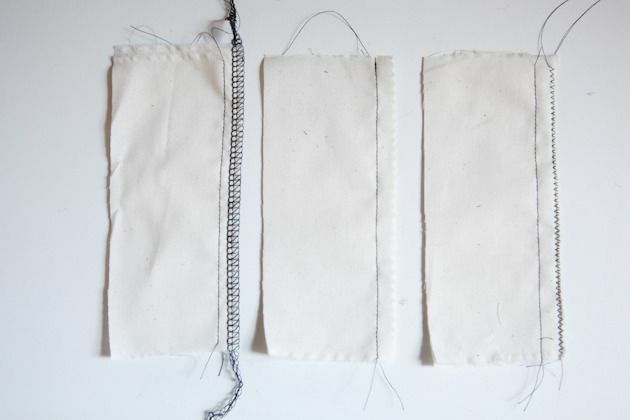 I will be using a serger / overlocking my seams for the sewalong, but you can choose whatever method works best for you. Another seam finish that is really nice is french seams. The reason that I don’t recommend it for the pattern is that it is a tricky technique to do with the inseam pockets. It is not impossible, and there are tutorials on the internet for it, but I will not be going over it for this sewalong as I feel like it’s a more advanced process. OK, that finishes us all up for today. Tomorrow will be much more fun as we actually get to start sewing! Please leave questions in the comments and I will try to reply to them as soon as possible so that we can all stay on track. I’m so excited to get going. I just finished my muslin process and changed the bodice for me. On to the real fabric! yay! can’t wait to see it. good job doing a muslin. i dont always have the patience, but when I do it’s always better. sorry it was giving you trouble! you do not want a gathered neckline for sure. i bet that is not comfortable. 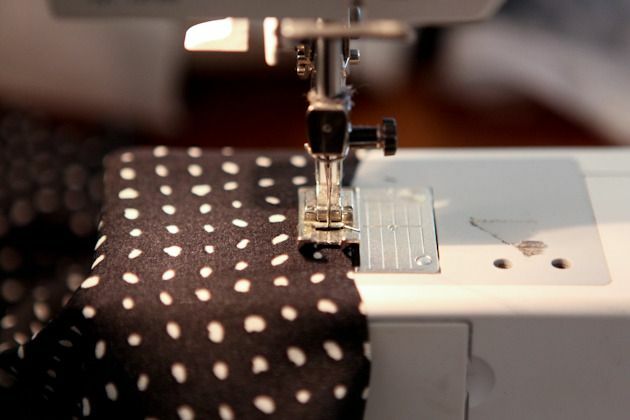 staystitching is usually the same stitch length or a little shorter than normal. but staystitching is to help the neckline and armholes not to hurt so if it’s not working for you that I would omit that step instead of risk having any gathering. just be super careful not to stretch those areas out in future steps. if you want to still staystitch I would check the tension on your machine and make sure that your sewing needle is an appropraite size for lightweight fabrics. i am guessing that it is just having a hard time with only one layer of fabric that is so light weight. In putting together pattern now. Seems like numbers 22-23 and 28-29 have some lines not meeting up?! Just checking if there’s something wrong. thank you so much for reaching out about this. i think we got it all sorted out via messaging but if you have any further problems with it please let me know. I can’t wait to see yours! I made a muslin of the bodice before I started, and added 2″ to the length (I’m 5’8″), and added an extra button. After I attached the skirt of the dress in my fashion fabric I tried the dress on and the back poofed out a lot – I actually only needed to add about 1″ to the length. Luckily it didn’t take too long to unpick and hack off fabric from the bodice (and luckier, the extra buttonhole fell within that inch I removed). So if you just muslin the bodice, maybe also attach the waistband and hold it at your natural waist so you’re sure it’s the right length! thats a good idea. i think people assume that the waistband will attach to the bodice but it actually attaches to the skirt portion so if you just muslin the bodice it will feel a bit short waisted. thanks so much for chiming in! Hi! I am a little behind on the sew along but I just sewed up my muslim and it feels very wide and boxy. I am petite and small chested so I was just wondering how much attaching the skirt and the drawstring can help with fitting? When I cinch up the waist the bodice looks okay but I am wondering if the top should be a little more fitted to start? Hopefully this makes sense and thanks for your help! dana, it is supposed to be a bit wide at the bottom so that you can get it on and off with the drawstring and the bodice does have a relaxed fit. If you take it in a lot more you may not be able to get it on since there is no zipper at the waist. fabric choice changes the feel a lot. if your fabric is light weight and flowy then it should soften alot once you cinch it up. that being said, it sounds like you are petite so it’s not a bad idea to adjust it a bit under the arms if necessary. feel free to email me a few pics if you want so that i can give you a more specific recommendation. Nevermind. Just realised I could measure the skirt front and compare to figure it out. Center front marking it is! 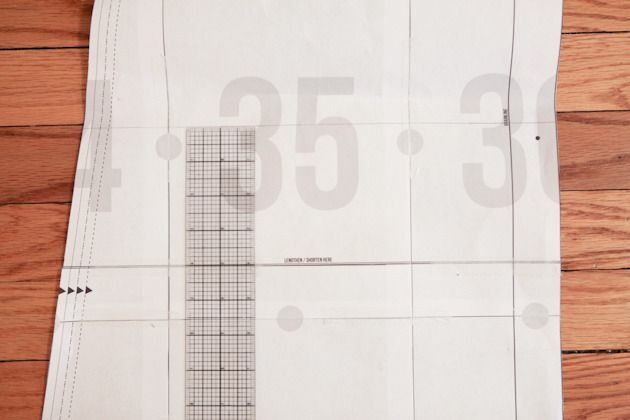 question about pattern matching when cutting the bodice – should i use the “center front” marking to line up the pattern? it’s too much for my brain to figure it out with the fold lines, etc… thanks! yes the center front line is there for pattern matching. line that up for both sides and you should be good to go.